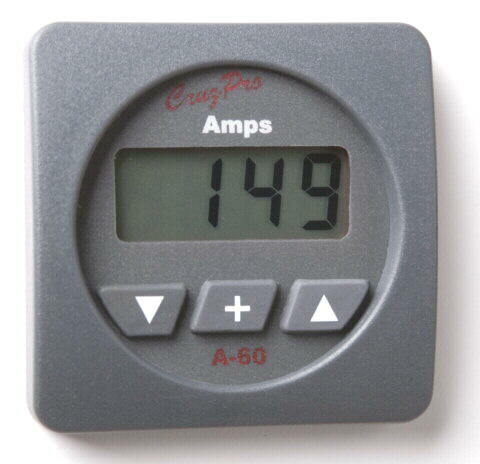 The A60 Digital Amps Gauge provides accurate low cost digital instrumentation for amps. You can program the gauge to work with a 5.0 to 900 amp shunt (available seperately). Five levels of backlighting can be selected and all set-up and calibration constants are saved to non-volatile memory. All constants and calibrations are pre-set during manufacture but you may alter these settings to suit your particular needs. Calibrations can be altered using the front-panel switches for shunt size and amps. With a press of the button you can zero the display automatically and display 0 to 900 amps of current. Resolution is 0.1 amps to +/- 90.0 amps (for shunt size < 90 amps) and 1 amp to +/- 900 amps (for shunt size > 90 amps) at an accuracy of better than +/- 3% +/- 1 digit (can be user calibrated using the front-panel switches). 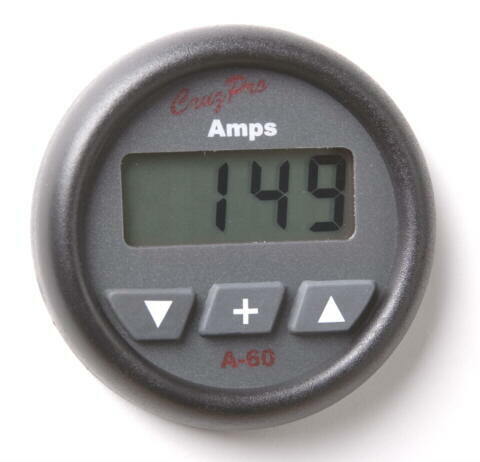 The A60 draws only 0.017 amps and can be left on continuously. 5 levels of backlight (including OFF) can be selected from the front panel and is saved to non-volatile memory. The A60 outputs serial data on the standard NMEA 0183 serial data line at 4800 BAUD. This ASCII information can be used to log performance or repeat the information at a remote location (see www.cruzpro.com/rp30.html and www.cruzpro.com/rp110.html).